Carly Simon might have given clouds in your coffee a bad name, but we’re all over them. Keep reading for our list of the best at-home milk frothers. Of all the little indulgences we permit ourselves as part of our day-to-day lives, coffee is probably one of the most commonly enjoyed. Gone are the days of Maxwell House and Kenco, here to stay are the luscious lattes, creamy cappuccinos, and rocket-fuel ristrettos (to say nothing of the half-caf one-shot vanilla frappa-mocha-ccino). But what if we told you you could make coffee-shop quality milky marvels in the comfort of your own home, for a fraction of the price? And you don’t even have to get out of your dressing gown. We’re sold. The secret ingredient to making lattes at home is a great milk frother, and we’re here with our round-up of the best to help you decide which one’s for you. If you keep a keen eye on the barista while they’re making your morning brew, you might have noticed that latte and cappuccino foam have different requirements. A home milk steamer that automatically heats and froths milk to its optimum for your chosen drink is perfect for aficionados, and with a decent number of temperature settings, it can even heat up baby milk, too. If you share a kitchen or otherwise don’t have a lot of space for another appliance, you can buy a handheld milk frother wand, easily stashed in a drawer after it’s done its bit. The only problem with these is that you’ll have to heat the milk first — no great pain with a microwave-safe jug, but still something to consider. Finally, if you’re in the habit of making rounds of drinks after dinner, or having the girls or the guys round for coffee mornings, be sure to keep an eye on the capacity offered by each machine. A machine with a bigger capacity will, out of necessity, take up more room on the worktop, but it makes fulfilling large orders a breeze, especially when compared with the stop-and-start nature of a more compact model. The Krups XL2000 has many charms, but it ultimately earns our top spot with its admirable ease of use and effortless cleaning. It has three user-friendly buttons that steam milk to the optimum temperature and consistency for your chosen drink — cappuccino, latte, or hot chocolate/hot milk — and a marked reservoir that shows how much milk to use for each. Its non-stick coated stainless steel interior means no burnt-on milk, and the multi-directional pouring rim, plus easy-grip glass lid and comfortable handle, makes serving seamless. This Hotpoint frother has four temperature settings, running from cold to 85 degrees, the perfect temperature for a steamy hot chocolate. But undoubtedly its most clever inclusion is the 40 degree baby milk setting, which takes the guesswork out of heating milk for little ones, cutting out the risk of burns, and eliminating the need for a separate gadget. The removable stainless steel jug also makes it easier to clean than many of its counterparts, a common gripe of home frothers. As well as the standard silver, the VonShef Milk Frother comes in stylish metallic red and trend-led copper finishes, adding a touch of class to the everyday ritual of making coffee, and to your worktop. It has the smallest capacity of any steamer on our list, which means it’s not ideal for hot chocolates or full cups of warm milk, but this is quite understandable for the low price, and it’s perfect for heating small portions quickly and easily, making it our best single-serving milk frother. The Severin SM 9685 is a breeze to use, no matter your level of familiarity with the ways of the brew. The super simple 360 degree connector means no shimmying and shaking when trying to get started, the dishwasher-safe detachable stainless steel frothing jug makes it easy to clean, and the lid opens for the inclusion of powders or syrups while in use. Its real selling point, though, is its temperature control, with a whopping five temperature settings for making all manner of hot drinks. This Aerolatte offering more than earns its place as the only handheld milk frother on our list. 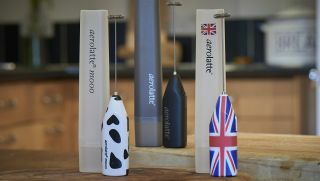 As well as allowing you a great deal of control while producing foam for hot or cold milky drinks, this frother can also lend a hand (sorry) in preparing smooth soups and sauces, whipping up fluffy meringues, and whisking eggs to perfection for an omelette, making it a great all-round kitchen gadget that takes up no space at all. With no vibration and no noise, and seemingly in the blink of an eye, the Nespresso Aeroccino Makes perfect frothy milk, hot or cold, with the bare minimum of fuss. Its quiet, unassuming nature makes it perfect for early risers and morning commuters trying to keep their morning ritual on the down-low — and did we mention how quick it is? It also features easy moveable interchangeable spinners, one for frothing and one to stir. Pair with a Nespresso coffee pod machine for everyday joy and café quality.